Company ordered 4. 3 arrived with a rattling noise. The metal weighted plate inside had broken off the plastic standoffs for the screws. Replaced via CDW support. Just opened one of the replacements, same rattling, one of the standoffs broke a small part. 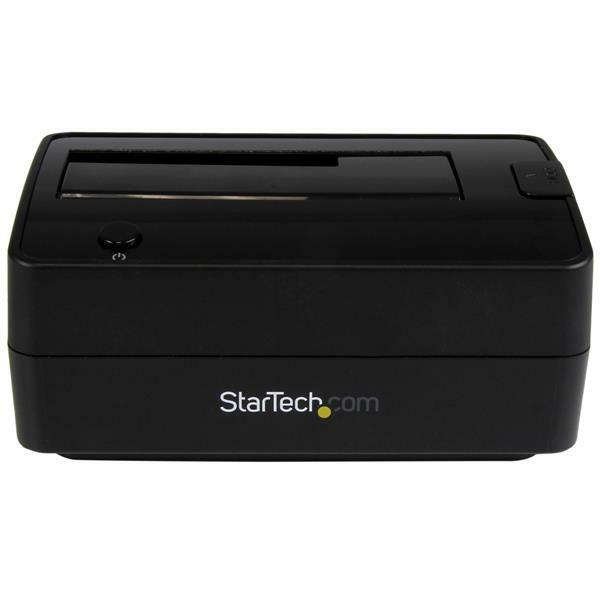 Great for docking all kinds of drives and transferring data. Love the USB 3.1 and the eSATA feature. However, one thing I can NOT do is update firmware on Samsung SSD drives via eSATA. The Samsung Magician firmware insists the Samsung SSD drives are not genuine, and will not give the option to update the firmware. If I use a different dock with eSATA on the SAME SATA port on the SAME computer, the Magician software sees the SSDs as genuine, and I can update the firmware. No idea why this dock doesn't work for that. I tried updating the firmware, but that was just for the USB controller, and did not seem it impact the eSATA function. No dropped or drive not recognized. 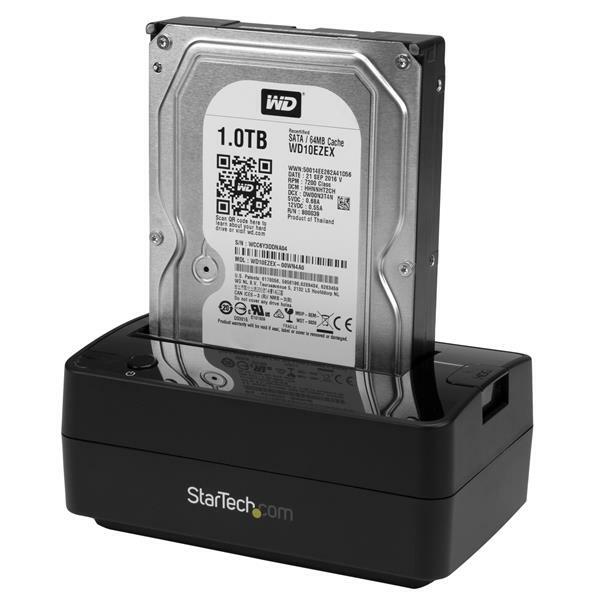 Anyone used it with a hard drive over 6tb? (5 stars) This device is a must for tech support! PC or laptop will not boot due to faulty hardware? No problem - your data will not be lost. 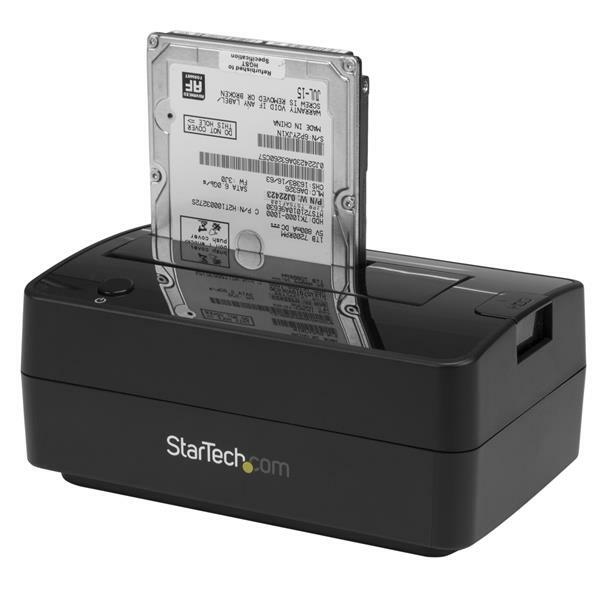 The 2.5/3.5" drive docking station connects to your PC / laptop and loads the hard drive as another drive so you access your coveted data! Connecting by usb or esata the transfer speeds do not disappoint. If there was a way to have the docking station powered over a usb cable without needing the power adapter that would be the only change I would make to this device. I received this product in exchange for an unbiased review. I use these all the time and this one works very well. Plug and play worked well and usb 3.1 speed is great. Not much to say other than, "It works." The rotating cover that slides down with a 3.5" drive on the dock tends to buzz as the drive vibrates in use. A dab of silicone on the edge of that cover took care of that. eSATA performance was as expected. USB 3.1 seems like overkill on a device like this since it exceeds the drive speed anyway, so provided that didn't increase the price... :) The transfers over USB are fast. If the computer and the receiving/sending drive(s) can match, then this dock will give you max speed possible with the drives in question. It just works: tested with Macbook, Windows and Linux using USB 3.1, USB 3.0, and eSATA. I received this product in exchange for an unbiased review. 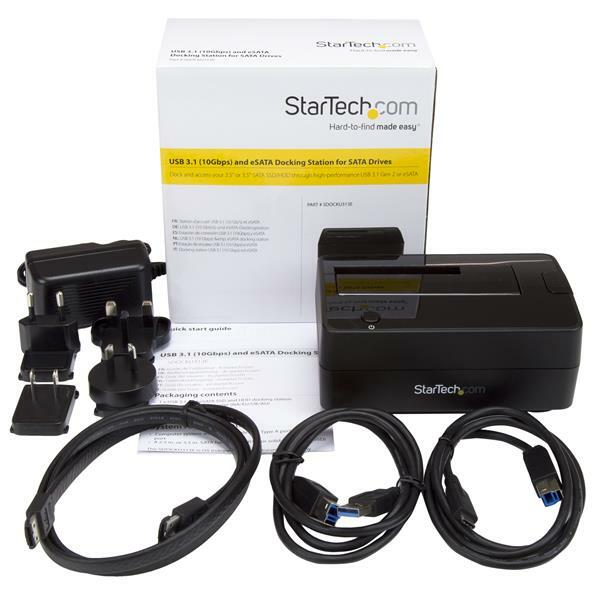 (5 stars) Must have tool for any help desk or tech repair. We gave this to our help desk and they absolutely love it. They're using it to backup hard drives before re-imaging a computer. USB 3.1 is a plus as it's much faster than our older tool which was only USB 2.0. It came with a variety of cables so you can hook it up however fits your needs best. We're using the USB-C connection which transfers very fast. The whole product feels quality built. I received this product in exchange for an unbiased review. This product is very simple to use. 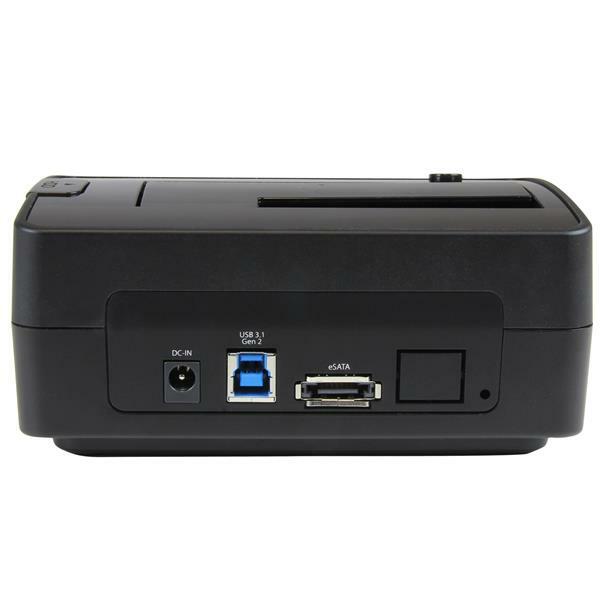 If you have a PC die but still need to retrieve data from the SATA drives then just plug them in to this device and your all set. What makes this even better is that it does not matter if it is a 2.5" or a 3.5" drive. I am the computer guru in my extended family so I am constantly fixing issues with their computers. This dock makes it easy for me to backup the data before I do any work on it. It also allows me to scan it for issues and viruses as well. The dock feels solid and the cables that come with it are of good quality. It comes with three cables. Two for USB (USB to normal USB and USB to USB-C) and one e SATA cable. It also comes with multiple power plugs for different countries. Overall a solid product. I received this product in exchange for an unbiased review. 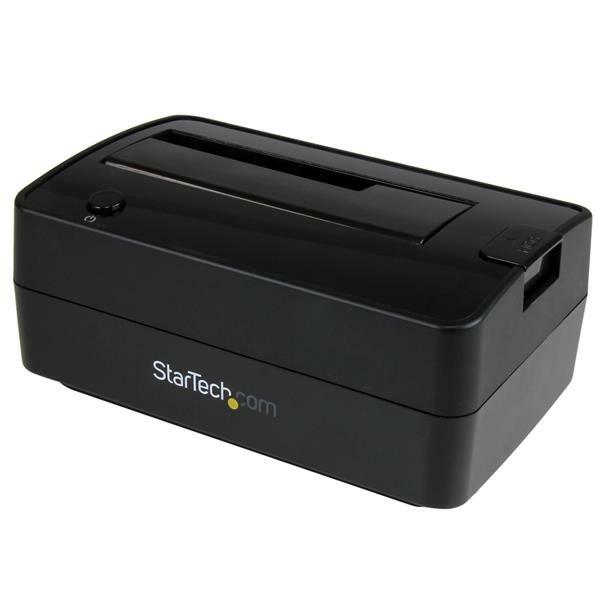 Another great dock from Startech. 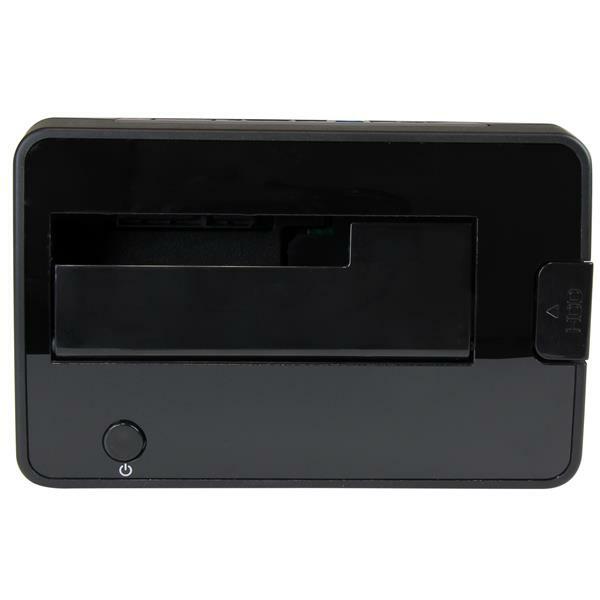 This unit allows you to mount 2.5 or 3.5 SSD or Hard drives easily. I found the connection to be solid with the drive connection and there did not appear to be any play to cause issue with connection. I found the cables supplied to be of a good quality and no issues at all could be found. I think this is a good solid build dock and should last for many years to come. No installation issues as I tested this with both my Mac and PC. This is a simple but well built dock. The transfer speeds were what you could expect from an external dock. "I received this product in exchange for an unbiased review"
I connected this unit to an older laptop uisng the USB cable then swapped some SSD and IDE drives in/out. All but 1 of the IDE drives (older Segate model) where loaded, recognized and performed as if it was part of the laptop. I had the same result when connecting this to a workstation with the eSata cable. It was nice that no drivers were required. Will be handy when implementing new workstations. Disclaimer - I received this product in exchange for an unbiased review. HD dock works well and as advertised. The only issue is it tends to make vibration noises from the folding cover. There is some minor humming due to vibration for the rest of the structure which can be felt to the touch.